In 1965, the freeway was approximately 50% complete. North of 59, the freeway stopped just south of San Felipe. Feeders were in place north of San Felipe, but the freeway and feeders appear to be under construction in Memorial Park. The 4-level stack at US59 was completed in 1964. The freeway main lanes stop just south of the interchange. The feeder roads were in place southward. The photo shows the substantial residential displacements that were necessary through the city of Bellaire. 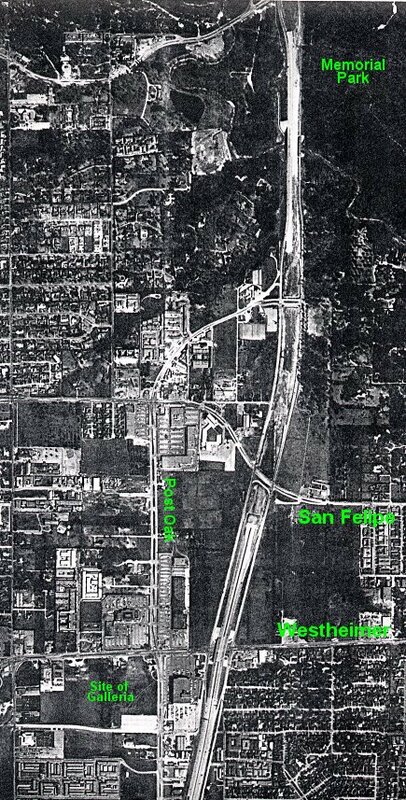 In the 1990's when options of expansion were under consideration, Bellaire was still spiteful that the freeway cut their city half. 610 from south of Westheimer to Woodway. This area was the focus of intense development from just after the completion of the freeway up until about 1983, when the 900 foot tall Williams (formerly Transco) Tower was completed on Post Oak just south of Westheimer. In about 1986, Houston's economy went into a major bust. Since then, only a few new towers have been constructed, mostly high-rise condos. In 1965, the feeders were in place south of US59, but construction on the main lanes has not yet begun.